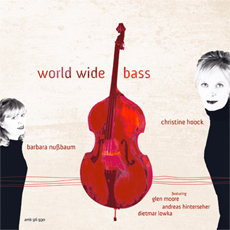 With its versatility the double bass joins together the most diverse worlds and people. And not just because, when travelling with it, people constantly come up and talk to you or, when touring as a duo, we always feel as though, really, there are three of us and we are bound to be the last people clearing customs at the airport. This amazing instrument is fascinating with its variety of tone-colours and its ability to communicate on so many musical levels. Like with our Contrabajisimo CD we decided to leave the standard and everyday paths of classical bass playing behind. Filled with musical wanderlust and curiosity we searched for new horizons and, in Glen Moore, Dietmar Lowka, and Andreas Hinterseher, found inspiring travelling companions who were just as inquisitive as we were.